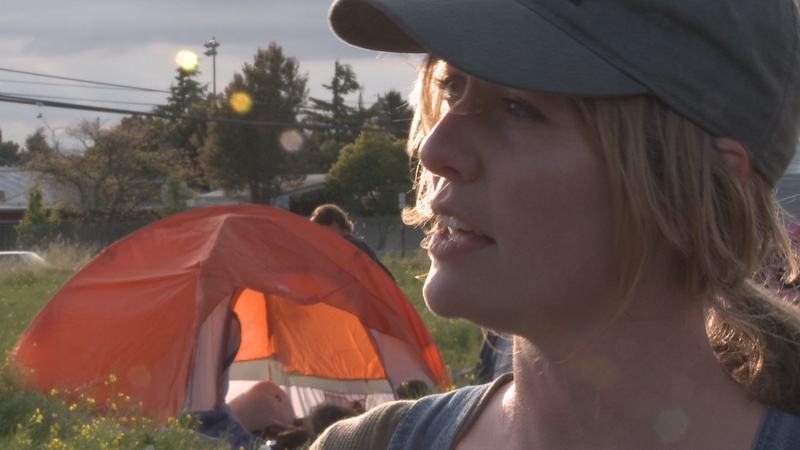 Occupy The Farm tells the story of a community’s fight to save public land for urban farming. When 200 farmers march to the gates of the last farmland in the urban East Bay near Oakland, they don't carry signs protesting University of California’s plans to build a shopping center. Instead, they carry tents, tools and 15,000 seedlings. They clip the padlock off the gate and march onto the fields. What happens next will change the fate of the land and introduce a new strategy for activism. Now Available on Vimeo, iTunes, Amazon, Google Play and Vudu. 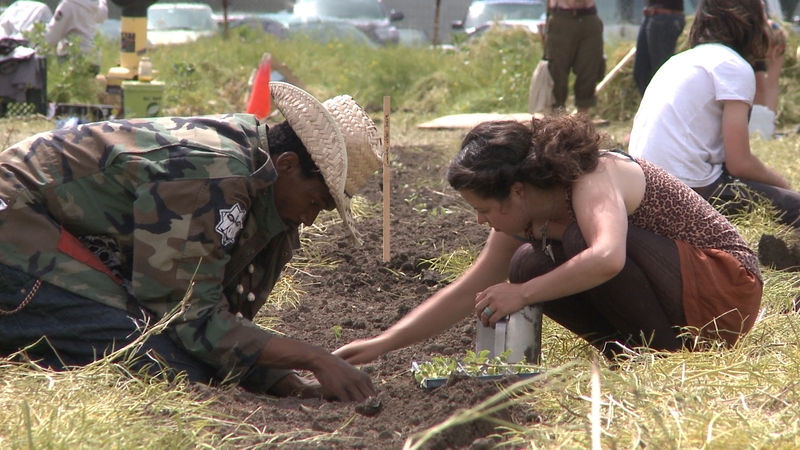 How Urban Farmers Used Occupy Tactics to Take Over the Gill Tract. On Earth Day April 22, 2012, I received a text: a couple hundred urban farmers were marching onto ten plus acres of fallow farmland and the site of a former agricultural research center known as the Gill Tract. The farmers hoped to stop development of a shopping mall and condo complex on the site of the former research station, and de-rail plans that threatened to remove the class one agricultural land from farming. 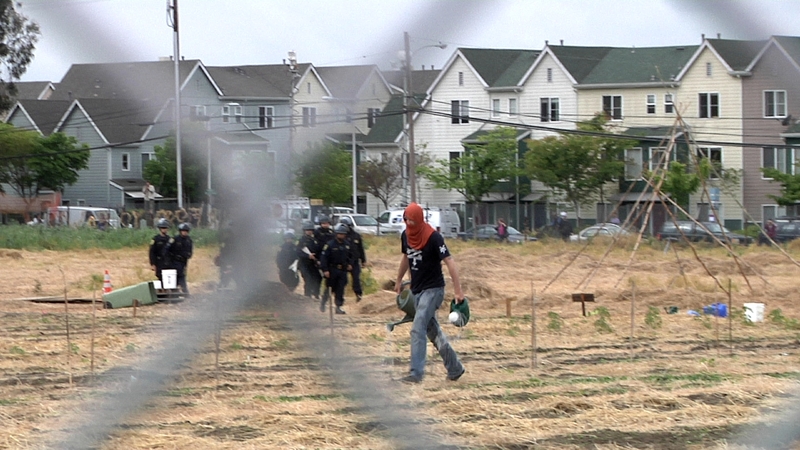 The activists brought with them 16,000 seedlings, roto tillers, shovels and tents. Within a few hours, they’d planted an acre of vegetables, put up a big banner that read: Occupy the Farm, and set up a tent village to defend the crops. We picked up our cameras that very first day and continued to follow the story over the next five months. And, we realized that these urban farmers succeeded because they physically reminded people of their fundamental connection to the land and the earth. Our cameras “occupied” the occupation. 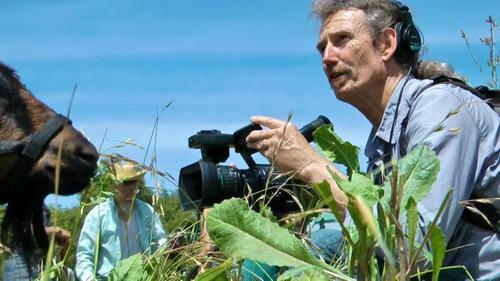 We witnessed the dramatic and rapid evolution of tactics and strategy of both the farmers and their adversaries – officials from the University of California. As a result, OCCUPY THE FARM captures a significant and on-going conflict: the showdown between over-development and agriculture, as well as the contest of wills between a grassroots, consensus based action, and the more rigid power structure of California’s largest landowner. 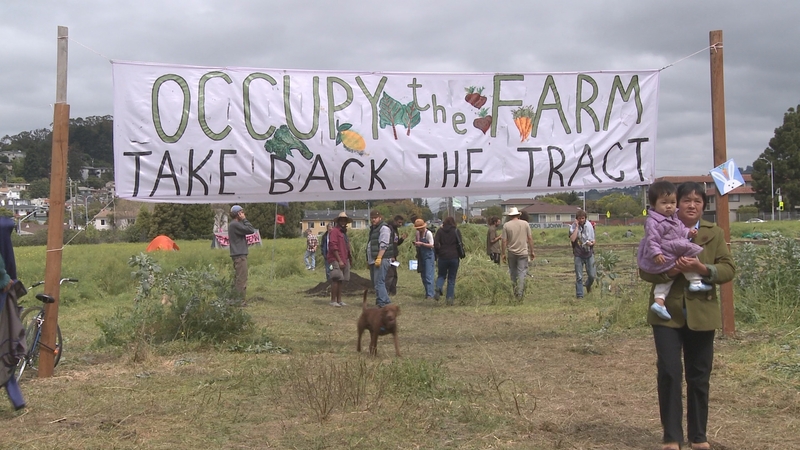 OCCUPY THE FARM reveals a new form of activism for the 21st Century. My name is Todd Darling. I’m a veteran filmmaker. I’ve worked as a director and editor for MTV, worked on the broadcast of five Olympic Games, edited over 50 nationally broadcast television shows, covered a revolution as a free-lance journalist, and directed independent films. My directing and editing credits include the reality show “Laguna Beach” for MTV (2004-2006), the feature documentary, “A Snow Mobile for George” (2009) about a cross-country trip to Washington, DC, now available on NetFlix, and the 30 minute documentary short, “Black Rock Horse”, about one of Burning Man’s boldest art projects. I am working with talented collaborators including: producer Steve Brown, who’s feature documentary “Spark: A Burning Man Story” about the dreams and challenges of Burning Man premiered at SXSW 2013; producer Carl Grether, the producer and editor of the recently completed “Edible City: Grow the Revolution” a feature documentary about urban farming and “food justice” in the Bay Area; and fellow editor/filmmaker Blake Hodges whose credits include the PBS show “Roadtrip Nation”, as well as extensive video work with Greenpeace, Sierra Club, Rainforest Action Network, and the ad agency M&C Saatchi. I’m asking you to join me in helping to share this powerful story with the world. Please tell your friends, and stay connected through our email list, Facebook, or Twitter. Share your stories of activism and direct action. Bring your community together for a screening event of Occupy The Farm. It's a great way to get your community talking. To find out how you can host a community screening at your local theater or obtain an educational or screening license, check out Occupy The Farm on Tugg. We want to hear from you! Sign up to be notified about upcoming screenings, events and community gatherings related to Occupy The Farm film. If your questions are about media, theater bookings, or distribution, it’s best to reach out to us by email at one of the addresses below. Please spread the word about Occupy The Farm. Every time you share this page, you enable more people to see this film.